The religious convictions of many in Russia from the army to the common person and even Russia’s famous President Putin is something we have written about frequently. Whilst Russians have always generally been known as being amongst the most religious peoples in Europe, contrary to popular belief in the west, the number of religious people in the government is actually quite significant. 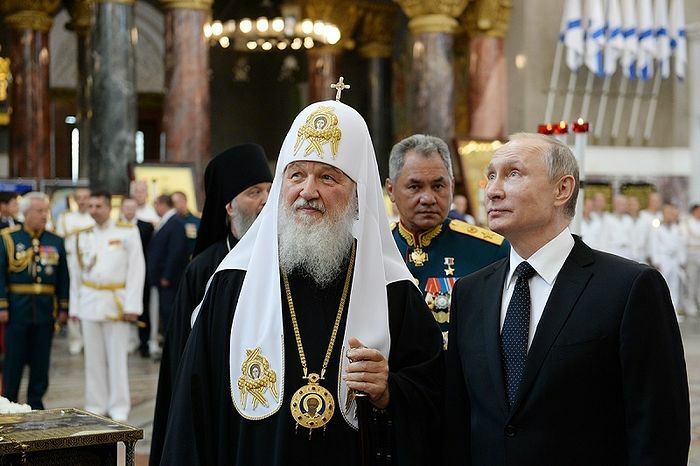 Whilst Putin’s deep spirituality is already well known, here are some other powerful political figures whose faith you may not have heard about. If you look closely at Russia’s impressive WW2 Victory Day parades on May 9th, you’ll see that upon departing the Kremlin beneath Savior Tower, the Defense Minister has consistently made the sign of the cross at every victory day parade since 2015. Force of habit, superstition, you say? Far from it. He is honouring the age-old Russian Christian tradition that gave Savior Tower its name. You see, fixed beneath the battlements of the Kremlin Bell-Tower is a famous icon, the Savior of Smolensk. The icon which depicts Christ as the “All-Powerful” and laying at His feet Saints Sergius of Radonezh and Valaam, has long been credited with saving the city of Smolensk. By long-standing tradition, everyone who wished to enter beneath Savior Tower, even the Czar himself, had to remove their head coverings and cross themselves, lest face a terrible curse. In 1812 the French were attempting to conduct an appraisal of the icon’s value and their staircase collapsed with a thunderous roar. When Napoleon himself, believing only in his own greatness, dishonoured the image, a strong wind immediately blew from west to east, tearing off his signature hat. The image disappeared in the Soviet days, apparently plastered over and forgotten, but it was rediscovered and reconsecrated in 2010 by the Patriarch. The ceremony was attended by then-president Dmitri Medvedev, whose wife, a leading figure in the Pro-Life movement in Russia, is known for her cooperation with the Church. Defense Minister Shoigu initially didn’t know the icon’s history, but once his friend told him this story, he immediately began to honour the tradition: next year and every year since then. This is not an isolated incident, Shoigu is a man long known for his good relations with the Church, having received awards from Patriarch Pavel of Serbia in 2003, 9 years before his appointment as Defense Minister. Shoigu receiving awards from Patriarch Pavel of Serbia when he was Minister of Emergency Situations. In his first year as Defense Minister, General Shoigu visited the Patriarch to promise his personal support, and that of the military, to restore and reaffirm the ancient traditions and continuing friendship between the Russian church and the military. This is not just empty talk and platitudes, Shoigu is a very active leader in this engagement. Almost four years later, he met with the Patriarch to tell him that the work of the church is clearly reflected in the moral condition of the army. Together they have seriously reduced immorality and all but eliminated hazing in the military. Shoigu is not only known for public displays of religiosity such as when he was with President Putin and the Patriarch recently in Kronstadt Naval Cathedral. He is also a man of the humble Russian faith that existed of old; there exist countless stories of his small non-publicized visits to village churches and monasteries. With Shoigu at the helm, it seems the future is looking very bright for the age-old friendship between Russia’s Church and Military.